Copper is a metal capable of perfect heat conduction. When it is heated, it distributes this energy in an even manner. This is important so your food can cook uniformly. Another advantage is your food can resist burning when you use copper, and you may even save energy by using this cookware. Not only is copper hygienic and resistant to corrosion, but it is very durable. You will be glad to use copper cookware for your cooking needs. It is important to know what kind of molecules we expose ourselves to on a daily basis. When considering cooking with copper, you will likely have many questions. But copper brings so many unique properties, not to mention it makes a beautiful set of cookware. Copper is clean and hygienic, meaning it is free from the microorganisms that cause the most issues in health when it comes to cooking. These antibacterial properties mean it can have an added benefit of protecting people and are the reason why places like hospitals use copper piping in their systems. The many properties of copper may also help with digestive health as they are excellent for combating gas, acidity, constipation, and other issues. In this way, copper helps to detox the body, properly clean the stomach, and prevent different wastes or harmful materials from forming. If you are having stomach issues, for example, copper water is a great way to combat it. Similarly, the function of your kidneys can be regulated by copper. Adding copper to your diet also helps you absorb nutrients that you eat. Storing your water in copper is another way to get copper in your diet. If you are looking to lose weight, eating and drinking properly will help you get there. In addition, drinking a lot of water that has been infused with copper will mean your body has extra assistance in eliminating and breaking down cells of fat that are stored in the body. When you get rid of the fat cells, you, of course, are also dispelling the fat. You will certainly want to replace any kinds of sodas or other sugary drinks – and even caffeinated drinks – with the healthy copper water alternative. Copper can be used for achieving healthy skin as well. You can prevent your skin from being damaged by UV rays and the sun by using copper. Copper is the predominant piece in creating melanin, the coloring component of skin as well as eyes and hair. Copper in your diet also helps your skin heal when it has been wounded as the creation of new skin cells relies on having copper. With new skin on the top layers, you will achieve clear and smooth skin quickly. Copper is an essential trace mineral, meaning it is completely necessary to the health of humans. It is unlike different nutrients because the body of a human is not able to produce it. Copper must be consumed in order to get it in the body. That is why it is so crucial to find various ways to add copper to your diet, whether it is by cooking with copper, storing water in copper, or simply taking supplements on top of a healthy and balanced diet. Because copper is an essential trace mineral, our bodies need it for us to live. We have copper in all of our tissues. Copper is also necessary for creating red blood cells and for the maintenance of the immune system and nerve cells. It is needed for the body to create collagen and for the absorption of iron. It even assists in creating energy. We mostly find copper in our brain, kidneys, liver, skeletal muscle, and liver. Having too much copper is just as bad as having too little copper, the imbalances affecting the way the brain functions. Improper amounts of copper are unfortunately linked to certain problems like Wilson’s, Menkes, Alzheimer’s disease, and others. Typically people do not experience deficiencies; however, a deficiency could result in serious cardiovascular diseases and related issues. It is important to understand, therefore, how much copper you should be getting and what that copper does for your health. Copper plays a critical rule in many bodily functions, but it is crucial to consult a doctor before starting a supplement as overdosing with copper can be just as problematic as not getting enough. Furthermore, you need to strike a healthy balance with iron to create the red blood cells your body needs. This helps with your immune functioning and the maintenance of blood vessels, healthy bones, and nerves. It also prevents issues like osteoporosis. Low copper levels can result in high cholesterol or high blood pressure. Supplementing with copper may also assist in preventing heart failure. Sufficient copper plays a role in the signaling of each individual nerve cell. Too little copper can create issues like neutropenia, or when white blood cells are too few in what is called neutrophilia, key for fighting infection. For this reason, if you have low levels of neutrophilia, you have an increased risk of getting an infectious disease. Low bone mineral density in the bones leads to osteoporosis, and copper is one of those minerals the bones need. Elastin and collagen, crucial materials for the structures in our bodies, need copper as well. Because copper has properties of an antioxidant nature, skin aging is likely prevented by getting adequate copper in your diet. Copper is necessary for making repairs of all kinds in your body and too little can cause joint dysfunction and tissue breakdown. Arthritis might be an indication of copper issues. So how much copper do you need? The recommended daily allowance, or RDA, is about 900 micrograms, or mcg, per day for both adults and adolescents. Adults of 19 or older have the highest limit, meaning no one should ever have more than 10,000 mcg – or 10 milligrams, or mg – in a single day. Having more than this could be toxic. However, it should be noted that, in the United States, but toxicities and deficiencies in copper are a rarity. 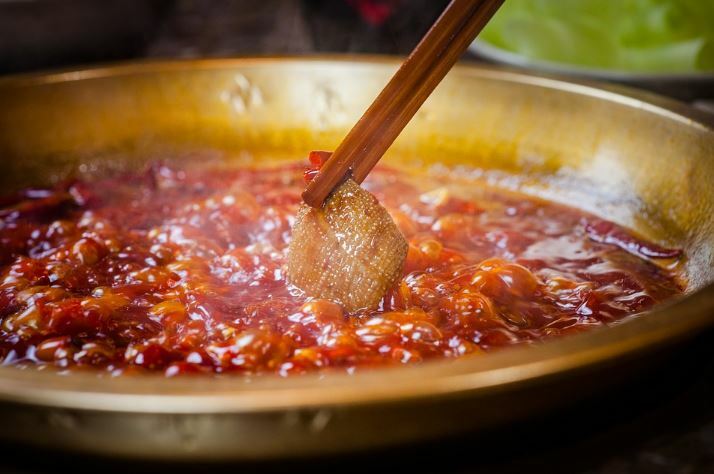 Now that you know the advantages of copper cookware, you should also realize you can cook with copper-rich foods to get even more copper in your diet. Perhaps the most copper-dense food is beef liver, a dish that can easily be cooked in copper cookware for added benefits. You don’t have to cook everything, however: for example, get dark chocolate to snack on or add sunflower seeds to your salad. Other foods you can add are cashews, chickpeas, raisins, lentils, hazelnuts, dried apricots, and avocado. Use a copper pan to cook some quinoa and sesame seeds, or even stir fry some turnip greens and shiitake mushrooms. In a copper baking pan, you can create desserts with blackstrap molasses or bake asparagus with slices of almonds. Take a copper salad bowl and create a salad with kale, goat cheese, and a sprinkling of chia seeds. Although there are many benefits of copper pans, it is also important to know a little about copper safety. Perhaps the most important thing is to know how to properly clean a copper pan. The last thing you want to do is have a really nice new piece of cookware and then tarnish it! You can start by placing a copper pan in the sink. Coat the outside of that pan in whatever kind of salt you have available. Once the pan is coated, pour white wine vinegar over the salt. Do yet another dusting of salt on top of that then let the mixture sit on the pot for 15 seconds. You should be able to see the process starting to work. Using a sponge, you should pour some more vinegar over the pot as you start to scrub the surface. 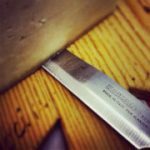 Make sure you put salt on the sides as well and scrub that with a sponge. Once you have scrubbed all of the surfaces, rinse of the salt and vinegar with water and your pan should now be clean! 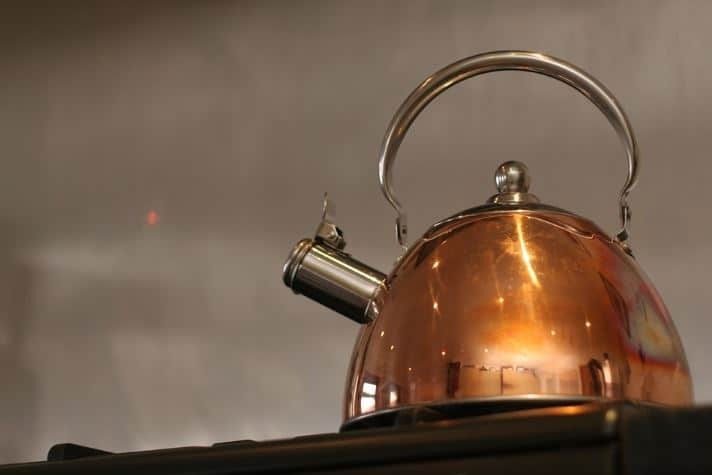 Ensuring your proper maintenance of a beautiful copper pan or other cookware is a necessary step to make sure you protect the things that will help you get to better health. It’s clear to see that, when looking at copper cookware vs stainless steel, the added benefits of copper put it ahead of other metals. 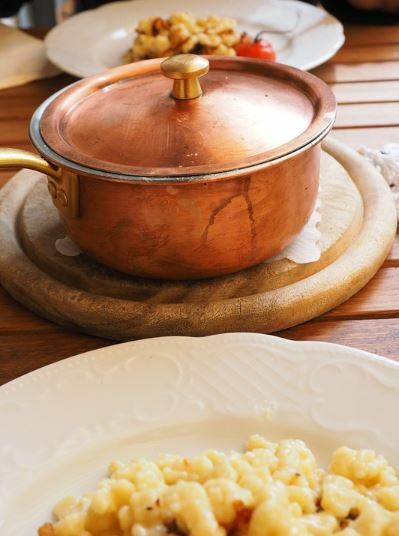 Now that you know a little about copper in your health and diet and why copper cookware can help you achieve your goals, consider going on a shopping spree to get copper versions of your favorite cookware. And don’t forget a vessel of copper for chilling water. Add a little lemon or cucumber and you will never want to overindulge in a diet-destroying soda again!